Chai confers with a colleague in SPiNE’s Yangon office. A visual and environmental studies concentrator with a minor in social anthropology, she finds that her work still relates to those studies. “I am particularly interested in the social and cultural aspects of architecture,” she explains. “I deeply appreciate the encouragement I had from my professors,” including the late anthropologist and documentary filmmaker Robert Gardner. Learning Burmese helped, though she describes “a wide latitude of interpretation built into the culture. After attending the same meeting, four people often have a totally different understanding of what was discussed and agreed upon.” She and Shwe also had to deal with a “general lack of technical expertise and skilled construction workers” when they started their architectural firm, SPiNE, in 2004. 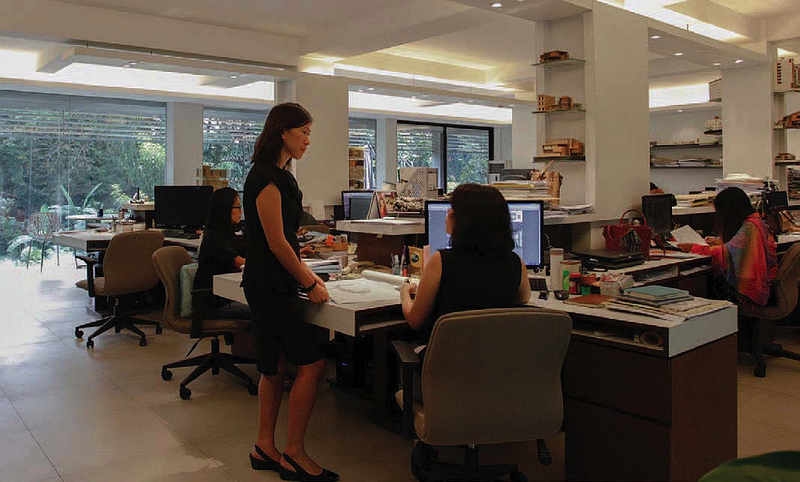 But Chai says this only pushed her to “understand how we can improve what we design, improve our details, and encourage our teams to do the same.” By 2012 The New York Times described SPiNE as “among the most prominent contemporary design and architecture firms” in Yangon; clients have included the World Bank and the U.S., British, and Korean embassies.